For inflating tyres, airbeds, boats, sports equipment and any other inflatable products. Complete with 3m of cable 12V car cigarette lighter plug, nozzles and adaptors. 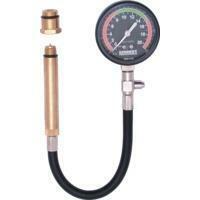 The dual air pressure gauge can be read in both lb/in2 and kg/cm2. 300psi. 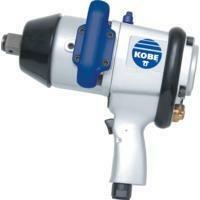 Ideal for car and light commercial transmission removal and installation. Fully adjustable universal rotary saddle with adjustable corner brackets and safety chains. 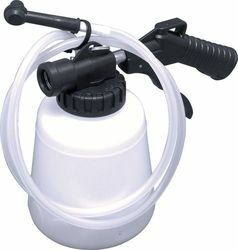 Foot operated pump and release valve leaves both hands free to manoeuvre transmission. Wide base with four 3" dia. swivel-type ball bearing castors providing stability and easy manoeuvring. Two-stage flash chromed rams inhibit rust from entering the hydraulic system. Lifts from 875mm to 1800mm. Saddle Tilt Side: plus/minus 20". Saddle Return Weight: 15.8kg (35lbs). 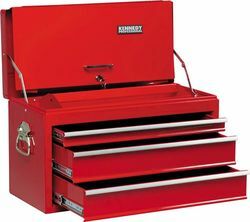 Supplied in a 3 drawer professional roller cabinet and a 3 drawer top chest. Manufactured from heavy gauge steel with double wall construction side panels and welded joints for added rigidity. Coated in a hard wearing epoxy powder. Fully opening drawers for extra accessibility. Quick release smooth running ball bearing drawer slides with double sliders on base drawer. Supplied with top mat and drawer liners. Fully locking. 125 x 50mm heavy duty extra strong castors, fitted with two brakes. Overall dimensions: 890 x 690 x 460mm. Castors are rated to 100kg capacity standing load per castor. Drawer loads should be evenly distributed. Top compartment size 89 x 661 x 150mm, drawer sizes 51 x 591 x 282mm (x1), 102 x 591 x 282mm (x2). Bottom compartment size 610 x 432 x 356mm, drawer size 591 x 410 x 102mm (x3). 25 piece HSS drill set 1-13.00mm x 0.5mm. 6 piece 200mm double cut engineers' file set. 25x 230 x 280mm assorted emery sheet. 76mm 18 blade combination feeler gauge set. 178mm double ended engineers' scriber. 150mm (6") engineers' square - BS939 grade B. 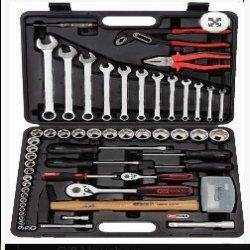 Tap wrenches 1.5-6.4mm and 6.4-19mm. 29 piece engineers' bit set: all 6mm hex x 25mm overall length, complete with magnetic spinner handle, 6mm hexagon bit adaptor and 6mm square socket adaptor. Hexagon: 2, 3, 4, 5, 6, 7 and 8mm. Flat: 3, 4, 5, 5.5, 6.5 and 8mm, 3/32", 1/8", 5/32", 3/16", 1/4", 7/32" and 5/16". Crosspoint: No.1, 2 and 3. Pozidriv: No.1, 2 and 3. 450g(1lb) ball pein hammer wood shaft. 6 off 12" x 1/2" x 18t HSS hacksaw blades. 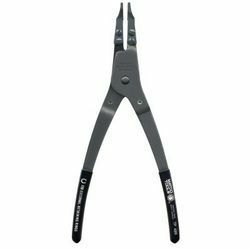 150mm engineers' combination pliers with side cutter. 8 piece Pro-Torq screwdriver set: Crosspoint No.1 x 75, No.2 x 100, Pozidriv No.2 x 100, Flared 6.3 stubby, 6.3 x 100, 8.0 x 200, Parallel 5.0 x 75, 5.0 x 150. 25 piece metric socket set 1/2" square drive sockets: 8, 9, 10, 11, 12, 13, 14, 15, 16, 17, 18, 19, 22, 24, 27, 30 and 32mm. Spark plug sockets: M10 and M14. 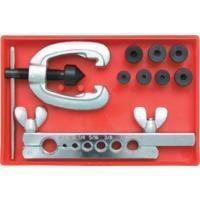 Accessories: quick release ratchet handle, sliding T-handle, universal joint, 75, 125 and 250mm extension bars. 9 piece metric hex key set 1.5-10mm. 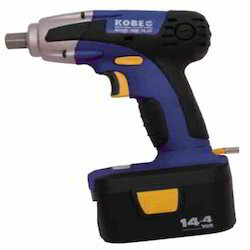 Cordless Impact Wrench is a quality industrial tool is lightweight and well balanced Soft grip design with 1/2” square final drive. One hour fast charger and two 14.4V batteries. Variable Speed Jigsaw is a two-ball-bearing armature design power tool for longer service life and high efficiency motor power transmission. Large soft grip with a large trigger switch fitted with speed control dial. Powerful dust blowing allows a clear view of the cutting line. Fitted with splinter guard and nozzle for connection with dust collector. No load stroke rate: 3,000spm. 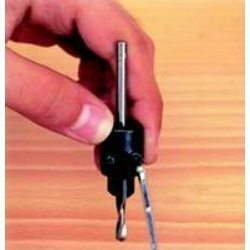 We provide 4 prong steel retractable claw. Flexible steel stem with a spring loaded plunger to open and close jaws. chrome plated and corrosion resistant. Ideal for recovery of small objects. Vertical Industrial Toggle widely used in various industries like mining, steel, coal and steel for crushing hard material to reduce particle sizes. These vertical industrial toggles are known for their outstanding quality and superior tensile strength. We supply these toggle which manufactured using graded raw material, our products are in compliance with the pre set industry standards. Clients can avail these products at industry leading price. 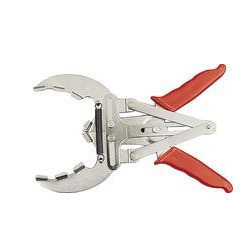 Manufacturing a wide range of hand tools, Backed by our efficient workforce, we are capable of providing our clients with extra long Valve Seal Ring Pliers. All our products are sourced from the authorized vendors of the market, who develop these using premium raw material in accordance with international quality norms & standards. All our products are widely appreciated by the customers due to their longer functional life, corrosion & abrasion resistance, dimensional accuracy and wear & tear resistance. Kennedy Automotive Glass Run Channel Cleaners are for the fast removal of glass, chips and debris from run channels on side windows. 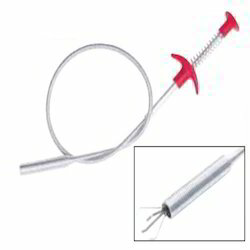 Suitable for unhooking locking weather strips around windscreens, with a long shaft for reaching deep into door recess. For use in hand lift applications only. Multiple vacuums used on a single load can only improve handling. If using more than one vacuum tool the ratio of maximum lift capacity does not increase. To lift heavier weights a larger vacuum must be used. All are fitted with a rubber suction which will not damage contact surface during the lifting action. For use on glass, tiles, plastic or other smooth surfaced non-porous material and can also be used for pulling out dents. Hand lift only, must not be used in conjunction with mechanical lifting equipment. 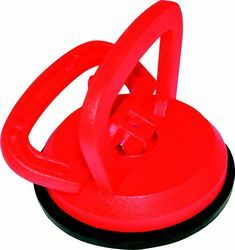 100mm Rubber rubber suction cup. Maximum lift: 45kg. 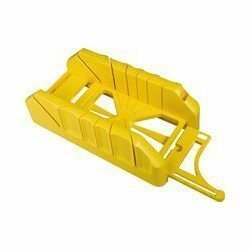 Used for clamping, pulling, bending, straightening, spreading and lifting operations. Snaps together quickly. 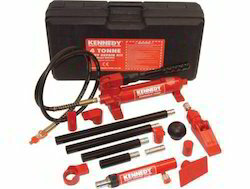 Heavy duty hand pump has automatic overload feature. Tough, blow moulded case. Strong flexible hose with spring guards at both ends. Hydraulic hand pump, ram and spreader. Ideal for pressing, bending and extruding. 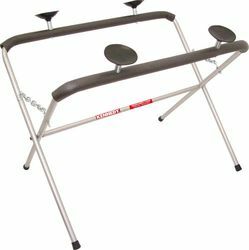 Sturdy steel frame with end braces and wide feet for extra stability. Work bed height is adjustable in 8 increments of 120mm, allowing large work pieces to be worked on with maximum flexibility. The Hydraulic pump can be manually operated or by compressed air connecting the airline supplied to an air supply line or direct to a compressor providing at least 8-9.5bar at 4cfm. Ideal for industrial and automotive applications. 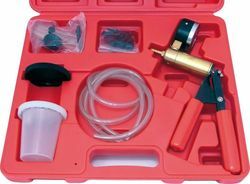 Vacuum testing kit that helps to locate and identify faults on cars, motorcycles and commercial vehicles. Supplied in robust blow moulded case. Contents: serviceable metal bodied vacuum pump, reservoir jar, transfer lid, storage lid, 4x lengths of 6mm ID tubing, 1x length of 4mm ID tubing adaptor. 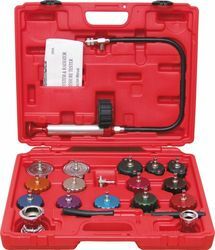 Set of brake bleeding adaptors, rubber cup adaptor. Dimensions (W x H x D): 350 x 305 x 80mm. Gross weight: 1.5kg. 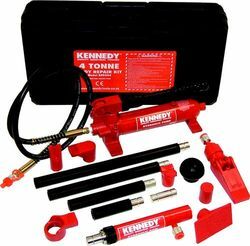 Single man operated pneumatic bleeder which simplifies the bleeding of hydraulic fluid in vehicle clutches and brake systems, also used for the collection of other non-corrosive fluid spillage. Has a 1ltr container with a 1/4 " NPT connection, operates from 90-145psi (6-10bar) air pressure with an air compsumption rate of 180ltr/min an extraction rate of 1.6ltr/min and vacuum (maximum) 550mm HG. 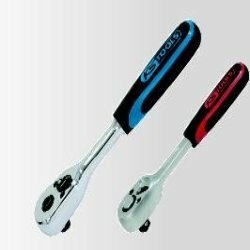 Handles non-flammable liquids between 0 & 80C. 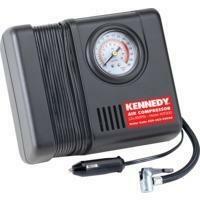 Designed for the pressure testing of cooling systems and radiator caps up to 35psi (2.5bar). Suitable for use on most makes of car and commercial vehicles, including: Mercedes, Ford, Chrysler, Peugeot, Honda, Lexus, Mazda, Suzuki, Toyota, Nissan, Opel, Volkswagen, Saab, Volvo, Audi, Citroen, Fiat and BMW. Contents: 14 radiator pressure testing caps, for use in testing cooling systems for leaks. Two cap adaptors, sizes 2-3 and 4-5, for testing radiator cap release pressure and seal condition. Two 200psi coolant hoses (5/16" and 3/8"), for use with T-adaptor for in-line pressure testing. T-adaptor for creating in-line pressure testing set-up. Two 3/4" hose clips. 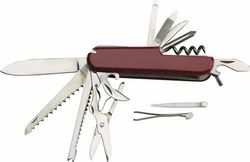 2,1/2" Spear Point, Saw, Scissors, Screwdriver & Bottle Opener, Tin Opener, Screwdriver, Fish descaler, Piercer/Reamer, Corkscrew, File, Threading Tool, Toothpick, Tweezers. 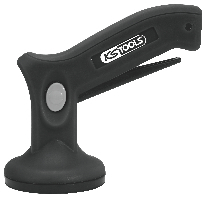 Ideal for general gripping especially thin materials. Bonded vinyl coated handle. Double polished head and joint. Induction hardened cutting edges. Contents: 215mm tailors, 215mm kitchen, 170mm paper & 125mm thread cutting. 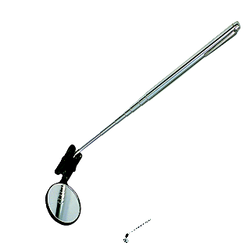 Inspection MirrorsWith flexible shafts which can be adjusted into any position. Available as standard or with light attachment. Both models have high grade distortion-free glass mirrors with chrome plated shafts. Inspection mirror with light requires 2x ‘AA’ batteries and has a swivel head. With Light AttachmentFlexible shafts which can be adjusted into any position. Manufactured from extra thick heavy gauge steel fitted with heavy duty piano hinges, lid stays and extra strength carry handles. Supplied with tote tray and drawer liners. One piece smooth running ball bearing drawer slides with double sliders on base drawer. Epoxy powder coated finish with reinforced corner tabs. 51 x 591 x 282mm (1). 102 x 591 x 282mm (2). Pneumatic fluid extractor for use in draining engine oil, water, fuel and hydraulic fluids from vehicle engines and other mechanical equipment, bleeding brake/clutch fluid and collection of other non-corrosive fluid spillage. High capacity 10ltr fluid reservoir ideal for garage, extension tube storage, used for workshop and on-site use. Supplied with 1500 x 15mm initial tubing with extension tubes; 700 x 6mm, 360 x 10mm, 310 x 6mm and 380mm brake bleeder attachment. Air supply 70-110psi (5-8bar), air consumption 180ltr/min., vacuum (maximum) 500mm HG, extraction Rate 2.5ltr/min., air inlet size 1/4" BSP. For the easy removal of most valve stem seals and lower valve spring guides in restricted areas above the cylinder head. Gripping serrations inside the jaws aid gripping the outside diameter of the valve stem seal. Steel pliers with double riveted metal handles. Overall length: 250mm. Reach: 50mm. These items are for the collection of waste oil prior to disposal in accordance with your local authority regulations. This sturdy mobile polyethylene container is for the collection of waste oil draining by gravity from engines/gearboxes. It has a capacity of 30ltr and a float level indicator to let you know when you are nearing its full capacity. The polya mide base is fitted with heavy duty castors and a handle for easy manouverability. The center shaft is height adjustable from 900 to 1600mm with a 395mm diameter polypropylene drain pan, the pan is fitted with an anti-splash mesh. 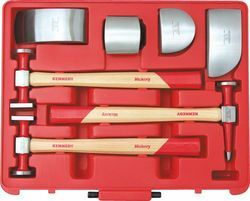 A comprehensive panel beating set containing: 1 x 12oz shrinking hammer.1 x 12oz flat faced bumping hammer. 1 x 10oz round finishing pick.1 each: curved 1.2kg, utility 1.2kg, heel and toe dolly.The hammerheads are manufactured from forged high carbon steel and then ground and polished on the faces and cheeks to a mirror finish. The hammer shafts are manufactured from solid hickory, with an octagonal cross section for improved grip and control when in use. The dollies are manufactured from drop forged medium carbon steel (SAE/AISI 1055) then heat treated and polished to a high mirror finish. Each one is laser etched for easy identification.Supplied in an impact resistant case that prevents the hammers and dollies clashing together and damaging the high polish finish, whilst in transit. What "Practical Classics" magazine say..."Best Buy"
"Full house to this excellent value set. The four dollies are beautifully finished and profiled, and are a good usable weight. The hammers are also superb, combining decent weight, well shaped shafts and good length. The faces are big enough for effective planishing too. Final plus point is the moulded case, which prevents the contents bashing together." 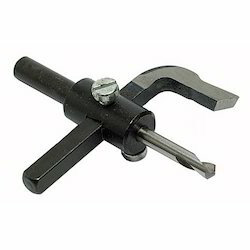 Trend tungsten carbide universal countersink - uni/cs, this TCT countersink clamps onto any drill between 3. 0mm and 7. 2mm in diameter. Recommended for wood and man-made boards. By reversing the countersink on the drill, it can be used as a non-cutting depth stop. 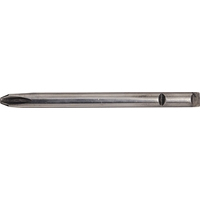 Ensures flutes of drill are aligned with flutes of countersink. Do not over tighten screw. Not suitable for production applications and not suitable for ferrous and non-ferrous metals. 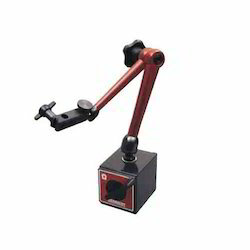 We supply a huge range LeverSwitchableElbowJoint2MagStandwith two magnetic faces which have large vision. These are available in various dimensions as per the specifications mentioned by clients. 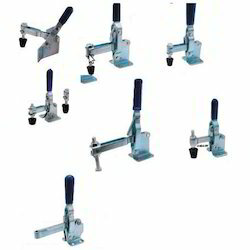 We offer them at competitive prices and highly demanded in the market for great accuracy. These are highly appreciated by our clients for the unique features such as high performance, long service life and easy installation. Leading supplier of Hand Tools, We offer Piston Ring Pliers with 50-100mm capacity. Lightweight tubular steel design with chain stops foam protection and rubber feet. Large rubber suckers prevent screen from moving during preparation. Folding frame makes this ideal for both workshop and mobile screen preparation. Supplied flat pack for self-assembly. Manufactured to double flare soft steel, aluminium and copper tubing up to .040” wall thickness producing SAE 45° flares. Heat treated alloy steel swivel is precision ground and chromed to reduce friction. Heat treated drop forged yoke. Each adaptor is clearly stamped with the size for easy identification. Bright lustre plate finish with contrasting black oxide. Will also produce a single flare. Sizes: 3/16”, 1/4”, 5/16”, 3/8”, 7/16”, 1/2”, and 5/8”. Standard Length For the easy removal of most valve stem seals and lower valve spring guides in restricted areas above the cylinder head. Overall length: 250mm, 50mm reach. Extra Long For the easy removal of most valve stem seals in multi-valve engines in restricted areas above the cylinder head. Gripping serrations inside the jaws aid gripping the outside diameter of the valve stem seal. 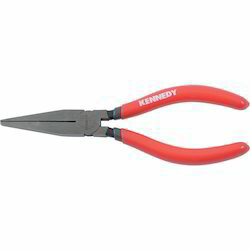 Steel pliers with double riveted metal handles. Overall length: 270mm, 80mm reach. Framework is manufactured from heavy steel with a powder paint finish. 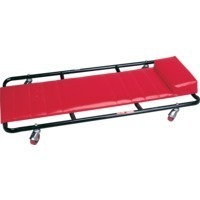 Furnished with a vinyl covered cushioning and are fitted with castor wheels for ease of movement. Square All Kennedy screwdriver bits have a hardness of 58 - 62HRC. High alloy chrome molybdenum steel for use on hand and power tools. 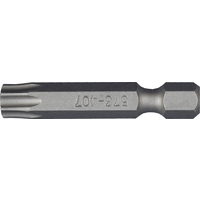 Drive in inch1/4" - 1/2"
drive in inch 1/4" - 1/2"
TX 1/4” Hex with ball recess. 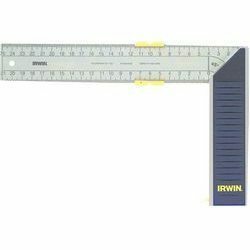 Bevelled squares are used for marking out lines, testing squares and angle lengths. Sliding bevels are used for marking angle lengths. All measuring tools are made from aluminium block and with a steel blade. The scales are etched on the surface which ensures long durability. Edge holder for accurate positioning. 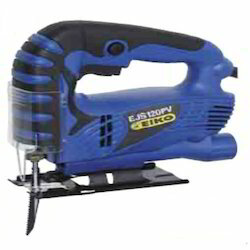 Stanley mitre saw block the easy to use solution for precise mitre cuts. Patented storage system for storing saw. 90º and 45º mitre slots as well as 22. 5º for octagonal shapes. Manufactured from lightweight high impact abs plastic.